I’ve delayed to update the potty saga because quite frankly I feel like a failure in this department. I think I could have waited a few more months and maybe the execution would have been stellar. I see P’s development with the process. She’s mastering the entire process, from pants down to wiping on her own much better. I see how a few more months could have helped. Then again, I wonder if she’s getting better because practice makes perfect, not aging. Also, I know our problems were tied to P wanting to control her universe. The times she went in her pants while looking at me straight in the eye, while mad at me for saying no to something have nothing to do with lack of bladder control and everything to do with her having FULL control of it! I could have waited two more years and we would have been at the same place. This is part of her personality. At the moment she is going in the potty on a pretty steady basis. We’re down to about one accident a day. It usually happens when she’s fully engaged in playing. I’ve learned a few things to make it better, given my daughter’s personality and need to fully control this process. It’s all in what I say. I stopped asking: “do you have to go potty”. Instead, I say: “will you tell me when you have to go potty?”. The former gets me a “NOOOO, NO, NO!”. The latter a “Yes!”. Lead by example. When in stores, or when we’re about to leave the house I ask her to join me in the bathroom so I can go potty. She’ll also go if she has to. She wants control. She’s got FULL control. When she says “potty”, I say “P do, P do”. Which means she goes to the toilet herself. I don’t carry her there anymore. She pulls down her pants, she gets on the toilet. I help wipe but she puts on her pants. It’s all HER process. Establish routine. I sing a song about wake up, then sit on pot! 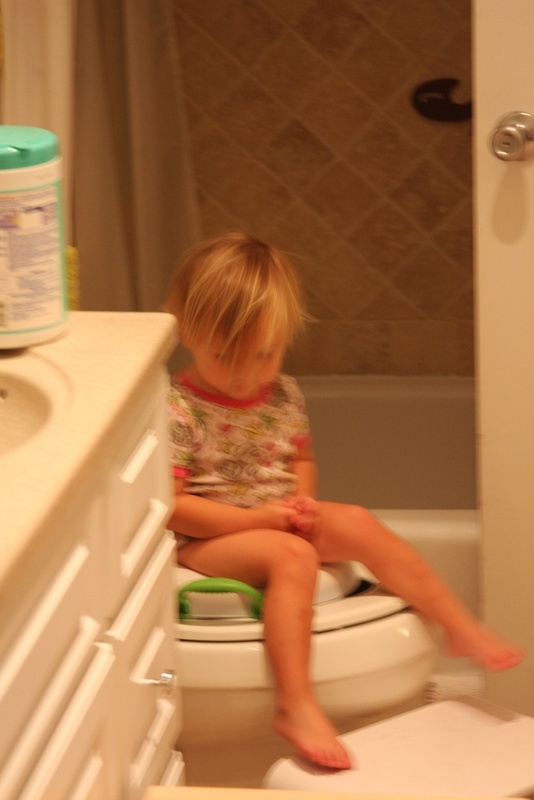 It helps to get her to the potty. Lots of praise for success. No reaction when she misses. After much analysis of what I’ve done wrong, and right, and wondering how P could go from three weeks of hardly any accidents to a complete regression I did find a coincidence. Our neighbor and her two girls, K and E left for a three week vacation. This was the only drastic change in P’s world and I didn’t take note that K and E have been P’s partner in crime and idol since she was born. The accidents started within days of them leaving. I realized I never talked to P about them going on vacation and that they would come back. I sat down and had this conversation with her. Things got better. Then they came back. Things got worse for about two days and now they’re getting back to good. Night time is another story all together. Let’s just say I’ve been doing a lot of laundry. Next Next post: A new generation.